Open water swimming is a distinctly different experience from what you’re used to in the pool. The water is not only your medium – it is now your teammate, your opponent, and your obstacle course! Here you’ll learn some of the most important aspects of swimming smart in wild waters, whether you are new to the rolling waves or are on your 100th Alcatraz. If you're a pool swimmer and want to transition, or have been in the open water a few times and want to up your game, this is where to start. You're a seasoned swimmer, with maybe a couple crossings under your belt. Take your skills to the next level with longer distances, and even triathlon. You've been bitten by the bug - Alcatraz is on your brain! Join the finishers of this iconic and historical crossing. We'll get you from start to finish. Make the most of your trip by checking out swimmer recommendations for transport, hotels, food, and more. Learn about communication, handling hypothermia, and safety precautions. The good news here is that you're not alone! Check the FAQ for common questions. This article will give you basics on gear, breathing, sighting, technique, safety, and more. We collected words of wisdom from Alcatraz swimmers to give to prospective first timers. In it to win it? See how you measure up in past events and look up friends and family. Yes, it is possible to acclimate to cold water! Learn how and prepare in this article. Check out photos from past events and see what it's like to join our family. Breathing. Sighting. Gear. Technique. Fears. Know the basics and you'll be better prepared to jump in the water on day one. Safety is our number one priority, so it is important to know how to communicate trouble with our safety staff and kayakers and respond appropriately to problems like hypothermia and ear issues. Fill a waiver. You only need to fill it once a year. If you don’t fill one online, you’ll be asked to fill one on site before you swim. Sign up for a session. Browse the calendar for a date. 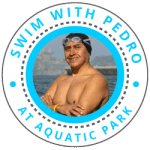 Click on the Swim With Pedro session in blue or purple (color designates location - it will also say Swim With Pedro at Aquatic Park or at Crissy Field), and it will take you to a registration page. There you can register and pay by card online. Submit the form and you should get a confirmation email. Check the map for where we meet. Some will be at Crissy Field; most are at Aquatic Park. Our Swim With Pedro sessions are a great place to ask coaches questions and chat with other like-minded swimmers! But if you have a burning question before you set foot in the bay, contact us. We're here for you! You've honed your skills as a swimmer, and you're ready to take it to the next level! You're ready to swim long and swim fast. Boost your skills with clinics, private lessons, and racing to the fullest. Alcatraz Classic will have you racing against some of the fastest swimmers around, and longer lengths like Bridge to Bridge 10k and the wild currents at the Golden Gate Bridge swim will thrill you! Also enjoy running and biking? It might be time to test your limits in the art of triathlon! Most of our coaches are widely accomplished triathletes - including Kathy Winkler, a four-time Ultraman champion. Join our triathlon clinics, shave precious time off your transitions, ask all the gritty questions, and learn about optimum nutrition and how to get ready to TRI your hardest. Pros and beginners alike join our weekly swim sessions in Aquatic Park and Crissy Field, but sometimes one-on-one with a certified coach will kick your game up a notch. Contact us to talk about your goals and set a time to meet with a coach to help accomplish them! With access to coaches and getting a feel for open water, swimmers new to open water will want to start with an Aquatic Park or Crissy Field Swim With Pedro group session. You'll need to fill a waiver and sign up for a session. If you've had some open water experience and are ready to have a sample of the real thing, a clinic is the right thing for you! You'll test some notable spots on a crossing by the prison itself. You'll need to fill a waiver and sign up for a clinic. You've got a good handle on currents, and you're a strong swimmer in the open water. If you can swim out there for an hour straight and cover over a mile but don't want the pressure of competition, try a Monthly Alcatraz. Some swimmers jump from training straight to competition. Rock on! If you're ready to make the crossing and want that finisher's medal to sweeten the deal, join us for a competitive crossing. Centurions is our biggest event at 400 participants and sees Olympians and first time crossers swim together, while Alcatraz Classic will have you sprint with the fastest swimmers around, and Winter Alcatraz with those impervious to cold. You should be able to swim a mile in the pool before transitioning to the open water, and we recommend some open water before you take on Alcatraz to maximize your enjoyment and success. That said, plenty of pool-only swimmers have enjoyed and made this crossing. In fact, with the right dedication and training, swimmers from all kinds of backgrounds can get that medal. You can read some first hand accounts here!